Note: The following account has been prepared from press reports. Seidel has a master’s degree in special education and had experience teaching emotionally disturbed students. She claimed her main problem was acquiring special needs services, such as respite care, from the Texas authorities. Somewhere along this process, the state took guardianship of Katia and put her in institutional and group home care, where the authorities say she is doing better. Court records indicate that Katia did not want to be returned to her home with Seidel. Seidel claims Katia is now longer being treated with the supplements and that she does want to come home when she is better. 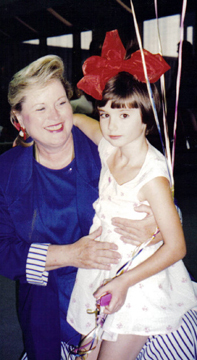 The Fort Worth Weekly article reveals that Katia was treated at TCU’s “attachment disorder” summer camp in 1999. In 2003, an NBC Dateline program featured this TCU program and Ronald S. Federici, a Virginia psychologist Attachment Therapist who has worked with the TCU program to develop “intense home programs.” This program, according to Dateline, included Federici’s potentially dangerous coercive prone restraint to enforce discipline as well as for emergency safety. (Prone restraint is demonstrated in the Dateline program when a boy refuses to go to the bathroom and his parents drag him off his bed to the floor for four hours of what is also called “Compression Therapy,” a style of Attachment Therapy.) The home program also includes a form of “belt-loop parenting,” where the child is kept within arm’s length of a parent at all time for months at a time; the child must also ask for everything, and parents are told to be unaffectionate with their adoptee. 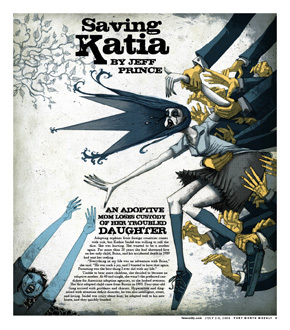 “Saving Katia,” by Jeff Prince, Fort Worth Weekly, 2 Jul 2008. “Finding the real child: A monumental research project may offer permanent healing to broken children adopted from foreign orphanages,” by Allison Fisher Speer, TCU Magazine, Jan 2006.